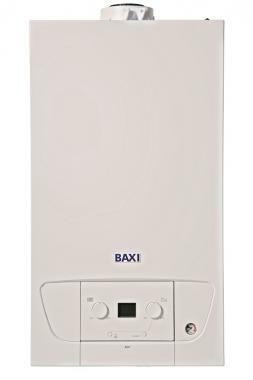 The 424 Heat boiler is a popular regular gas boiler offering from Baxi. This ‘regular’ boiler being (also known as conventional) heats your central heating system directly and also produces hot water for your cylinder. Being a regular boiler you will of course need a hot water cylinder making this boiler type not suitable for smaller properties with no loft space. This unit features a variety of elements designed to hit an efficiency rating of 89.1%, which makes the unit B rated. This boiler has an output of 24kW making it perfect if you live in a smaller property that does not have a high demand for hot water. This boiler has been designed to fit in those homes with minimal space, with it being a compact boiler, that is able to fit in a standard sized cupboard making it perfect to be hidden away - out of sight out of mind. The 424 Heat only weighs 19.5kg - which is the lightest boiler in the UK. Why does this matter? It makes for much faster installation … and when you’re paying by the hour, that counts. As with all Baxi’s in this range, it comes with an easy-to-fit wall mounted bracket - most installers are very familiar with this bracket type. This boiler does not require a pump overrun or even a permanent live - again, making for a fast and neat install. If you’re looking for some different power options, Baxi have you covered with 12kW, 15kW, 18kW, 24kW and 30kW outputs - so the unit is versatile enough to fit just about any home size. With this unit also comes five years worth of warranty to give you more peace of mind that you won't be caught short.